Vacation of Wins Letter (redacted) has been posted. The below documents were recently requested pursuant to the Mississippi Public Records Act. On February 16, 2018, the NCAA Committee on Infractions (COI) obtained a 30-day extension of time to respond to the University’s NCAA Appeal Brief, filed February 5, 2018. The deadline for the NCAA COI’s appeal brief was March 5, 2018. Under the NCAA rules, the deadline for the COI’s appeal brief will now be April 8, 2018. The University’s Reply Brief will be due 14 days later. Today, the University of Mississippi is publishing the Appeal of Infractions Report, which was submitted to the NCAA on February 5, 2018. Today, the University of Mississippi is submitting to the NCAA written notice of its intent to appeal the Public Infractions Decision Letter of the NCAA Division I Committee on Infractions issued December 1. The university has also retained the Mississippi-based law firm of Butler Snow to join the existing legal team of Lightfoot, Franklin & White and Bond, Schoeneck & King for the appeal and other related legal services. Don Barrett of the Barrett Law Group will also join the university’s legal team. Today, the NCAA’s Committee on Infractions issued its report to the University of Mississippi regarding the NCAA investigation of the football program. In the report, the committee disagreed with the institution’s position on most of the contested allegations. In addition to accepting our previously self-imposed sanctions, the committee has imposed a postseason ban for 2018. While we continue to review the full report, we will vigorously appeal the 2018 postseason ban. The additional postseason ban is excessive and does not take into account the corrective actions that we have made in personnel, structure, policies and processes to address the issues. Chancellor Jeffrey Vitter and Vice Chancellor for Athletics Ross Bjork will be available to the media at 1 p.m. CT in the Burns Team Meeting Room in the Manning Center to discuss the Committee’s findings. Consistent with the previously published 2016 and 2017 Notices of Allegations and the corresponding Responses to those notices, the names and other personally identifiable information of student-athletes have been redacted. The documents published today include booster names except for John Doe and his/her employee, and these two names remain redacted pursuant to the Hinds County Chancery Court’s order staying the Mississippi Ethic Commission’s Final Order. UM’s position is that the public interest is best served by releasing booster names. UM will await further direction from the Hinds County Chancery Court regarding the release of Doe’s name and the name of his/her employee. The University of Mississippi has publicly released versions of the 2016 and 2017 Notice of Allegations and UM’s Response to the NOAs (see links in right column) that include booster names except for John Doe and his/her employee. These two names remain redacted pursuant to the Hinds County Chancery Court’s order staying the Mississippi Ethic Commission’s Final Order. The University of Mississippi’s position is that the public interest is best served by releasing the names of boosters appearing in the 2016 and 2017 Notice of Allegations (“NOA”) and UM’s Response to the NOAs. Consistent with this position, today UM planned on publicly releasing these documents in accordance with the Mississippi Ethic Commission’s (“MEC”) Final Order. However, John Doe appealed the MEC’s Final Order. Today, the Hinds County Chancery Court entered an order staying the MEC’s Final Order in part. Pursuant to that order, UM will publicly release versions of the 2016 and 2017 NOAs and UM’s Responses on or before July 28, 2017, that include booster names except for John Doe and his/her employee. These two names will remain redacted pursuant to the court’s stay. UM will await further direction from the Hinds County Chancery Court regarding the release of Doe’s name and the name of his/her employee. Today, the University of Mississippi is releasing the February 22, 2017 Notice of Allegations and the university’s Response to the Notice. As stated in February when the Notice of Allegations was issued, we have cooperated fully with the NCAA enforcement staff over the more than four-year-long process. The university has concluded several violations of NCAA bylaws occurred, and we have taken responsibility for those violations. We have self-imposed significant sanctions on our football program including a postseason ban for the 2017 season, a reduction in available scholarships and recruiting days, and an $8 million forfeiture of SEC postseason revenue. Although we agree several violations occurred, we do not agree that credible and persuasive evidence supports all of the allegations in the Notice. Our Response details our position on each allegation, and we look forward to appearing before the Committee on Infractions. Please note: the university intended to release the Notice and Response with only the names and other personally identifiable information of student-athletes redacted. However, due to a case pending before the Mississippi Ethics Commission, the names of third parties have also been redacted. The university will revisit the disclosure of involved third parties after we receive more direction from the Ethics Commission. The University of Mississippi (the “University”) has a duty to its faculty, students, alumni and supporters, to fellow members of the Southeastern Conference (the “SEC”) and the NCAA, and to the public at large to operate its athletics programs in a manner consistent with the highest principles of intercollegiate athletics. This duty includes the obligation, whenever the University learns of potential conduct that transgresses those principles, to follow the evidence wherever it leads, regardless of whether that may result in adverse findings or potential sanctions. Simply put, the University’s commitment to integrity, honesty, and fairness in all endeavors requires that it “get it right.” This same spirit has guided the University’s response to the 2016 and 2017 Notices of Allegations. Consistent with its commitment to getting it right, the University has conducted an exhaustive and thoughtful examination of the evidence. Based upon that review and the high evidentiary standard prescribed by Bylaw 19.7.8.3, the University has concluded that significant violations occurred in connection with its football program over a period of years, including during this investigation. These violations, which include multiple, intentional acts of misconduct by (now former) University employees and (now disassociated) boosters, are serious. As described in this response, the University has held those responsible accountable – many in unprecedented, public ways – and has taken institutional responsibility for what has occurred. The University firmly believes its bold corrective actions will make a meaningful and permanent difference. In taking responsibility for what has occurred, the University has self-imposed significant and appropriate penalties. To determine the appropriate measure for those penalties, the University considered the breadth and scope of the violations along with two other factors: (1) the fact that all but three of the Level I allegations (i.e., Allegations Nos. 5, 20, and 21) were the result of intentional misconduct specifically intended to evade monitoring systems implemented by the University, the athletics department, and the head football coach; and (2) the University’s proactive approach to compliance, including its efforts to detect and investigate potential violations, and its exemplary cooperation throughout this four-plus-year process. Based upon these factors, the proper classification for this case is Level I – Standard. The University has accordingly imposed meaningful Standard core penalties. As detailed below, these penalties include: a post-season ban, which necessitates the loss of nearly $8,000,000 in SEC revenue; a double-digit reduction of scholarships; a more-than 10 percent reduction in off-campus evaluation days in each of two years; a nearly 20 percent reduction in official visits; a more-than three month prohibition on unofficial visits; the refusal to grant a staff member’s request for a multi-year contract; the disassociation of involved boosters, including a prohibition on attending University home athletic events and a restriction on entering all athletic facilities; violation specific rules education; and a $179,797 financial penalty. See Part D.3 for additional self-imposed penalties. Yet, there are instances in which the University disagrees with the enforcement staff’s interpretation of the evidence or its sufficiency. Most importantly, the University contests the allegations concerning institutional control and head coach responsibility (Allegations Nos. 20-21). The University has consistently satisfied each of the four pillars of institutional control: (1) “adequate compliance measures exist”; (2) “they are appropriately conveyed to those who need to be aware of them”; (3) “they are monitored to ensure that such measures are being followed”; and (4) “on learning of a violation, the institution takes swift action.” See Exhibit IN-1, Division I Committee on Infractions’ Principles of Institutional Control (the “Principles”). It has myriad compliance measures in place, many of which have detected or prevented violations. Those measures have been bolstered over time as a result of evolving national best practices and “hot-button” issues, self-evaluation of areas to improve, and analysis of major infraction reports from across the country. The University has also improved its compliance systems based on lessons learned during this investigation. Because an institutional control charge was not included in the 2016 Notice based upon substantially similar facts, it appears this charge rests on the increased number of allegations, which has never been – and should not be – this Committee’s focus. Instead, the question before the Committee in evaluating the institutional control charge is whether the University had appropriate policies and procedures in place at the time of those violations, and if so, did the University implement and enforce those policies. Second, after careful analysis of the testimony and supporting records, the University has concluded that head football coach Hugh Freeze has met it and membership’s expectations to emphasize and promote compliance and to implement strong and comprehensive monitoring. Click here for complete transcript of video that includes detailed summary of the new allegations. 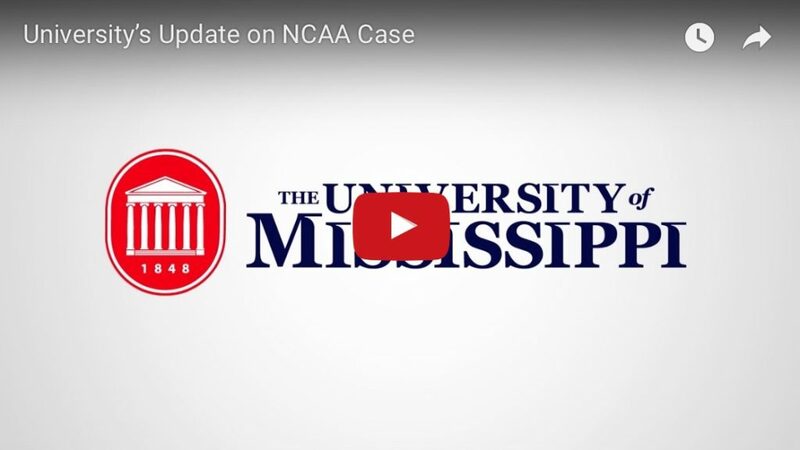 The University of Mississippi is grateful to conclude the women’s basketball and track and field case and appreciates the Committee on Infractions’ efforts to bring closure to this matter. The University is equally pleased the Committee accepted the proposed and self-imposed penalties without further addition. The University continues to work with the NCAA on concluding the case related to the football program. Everyone involved is committed to bringing these issues to a resolution as soon as possible. To read the NCAA’s press release, please click here. To read the Committee on Infractions’ complete report, please click here. To read the Athletics Compliance External Review report, please click here. As you know, the University of Mississippi has been cooperating with the NCAA since 2012 on a review of potential NCAA bylaw violations associated with our Department of Athletics. After almost four years and more than 265 interviews with current staff, former staff, boosters, third parties, and student-athletes, the NCAA issued a Notice of Allegations (“NOA”) to the University on January 22, 2016, alleging violations in women’s basketball, track and field, and football. According to the NCAA enforcement process, the University had 90 days to formally respond, and we submitted our Response to the Notice of Allegations (“Response”) in April. Around that same time, another involved party requested and received a 30-day extension. Because that extension has now elapsed, we are releasing our Response and the NOA to the public. The NCAA has alleged, and we agree, that serious violations have occurred. Most of the more significant violations resulted from either (1) intentional misconduct and efforts to conceal that misconduct by former employees who face unethical conduct charges and personal sanctions; or (2) actions of individual boosters who conducted themselves contrary to rules education provided by the University. For 27 of the 28 allegations, we agree that a violation of NCAA rules occurred; however, for several of those allegations we do not agree on all of the facts. For five of those 27 violations, we believe the violation should be classified differently (e.g., the violation is alleged as a “Level II violation” but we contend the violation should be classified as “Level III”). In response to these violations, we have taken several corrective actions and we have self-imposed significant penalties. The NCAA Committee on Infractions (“COI”) will consider our Response as it determines whether to assess penalties in addition to the penalties we have already self-imposed. We based our self-imposed penalties on the COI’s decisions in other cases and the NCAA penalty matrix released in 2012. The University’s cooperation with the NCAA throughout this process has been exemplary. In fact, the University self-reported or played a central role in discovering most of the violations. When employees or student-athletes failed to live up to Ole Miss core values, the University took decisive action, including terminating or disciplining employees and imposing scholarship reductions and recruiting restrictions. The University also disassociated itself from representatives of Ole Miss’s athletics interests — boosters — who were involved in violations. The most serious violations involve academic misconduct that occurred in football six years ago and in women’s basketball almost four years ago. Before, during and since the issuance of the NOA, we have taken a proactive approach to compliance, rules-education, and monitoring. As our Department of Athletics has grown, so has our commitment to compliance. Since 2011, we have more than doubled our compliance staff and instituted more than 100 new compliance measures. On the first day of the 2016 NFL Draft, new information came to light involving a former football student-athlete. That very night, the University and NCAA began a joint review to determine whether bylaws have been violated, and we hope this review will be concluded soon. To ensure fairness to all parties and pursuant to COI procedure, we have asked the COI to remove the hearing from this summer’s docket until this review can be completed and closed. The Ole Miss family expects and deserves athletics programs that compete for championships, graduate our student-athletes, and operate with integrity. From the moment we learned about possible academic misconduct in women’s basketball in 2012 until today, the University has demonstrated its values, and we are a stronger University because of our decisive actions. We believe in our coaches, staff, and student-athletes, and you have our assurance that we will continue the pursuit of excellence consistent with the University Creed and athletics core values.